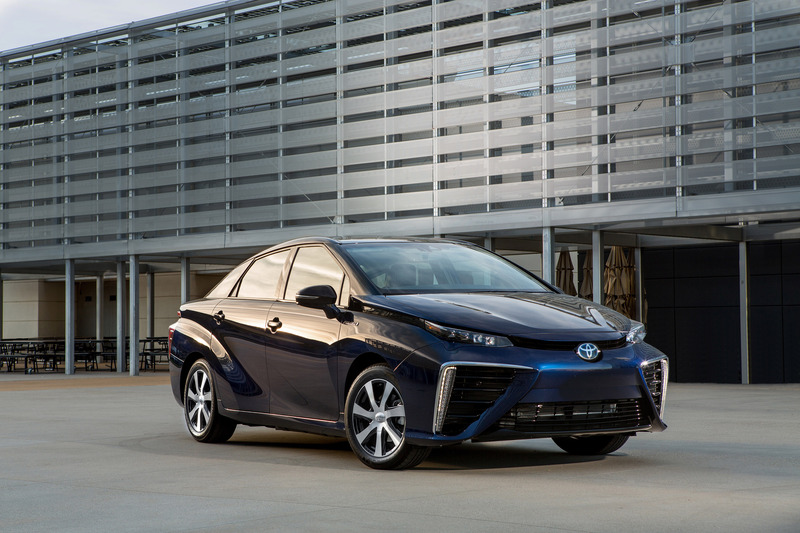 The Mirai signals the start of a new age of vehicles. 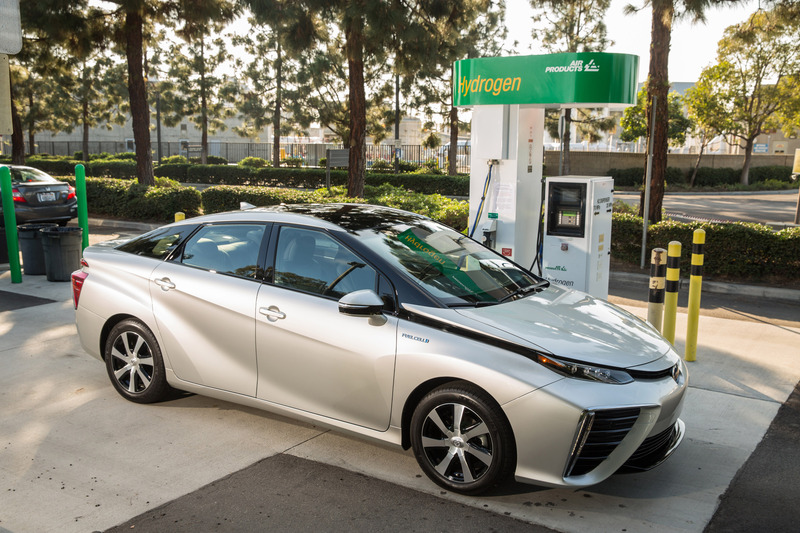 Using hydrogen - an important future energy source - as fuel to generate electricity, the Mirai achieves superior environmental performance with the convenience and driving pleasure expected of any car. 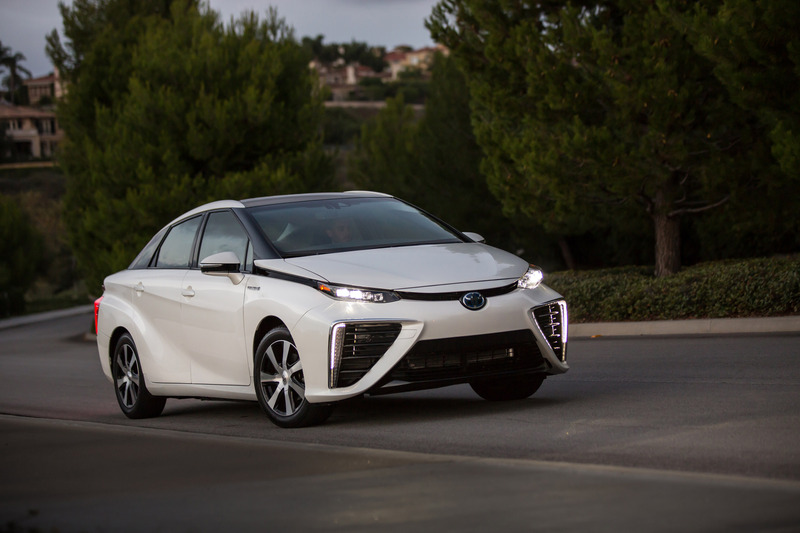 The Mirai uses the Toyota Fuel Cell System (TFCS), which features both fuel cell technology and hybrid technology, and includes Toyota's new proprietary FC Stack and high-pressure hydrogen tanks. The TFCS is more energy efficient than internal combustion engines and emits no CO2 or pollutants when driven. 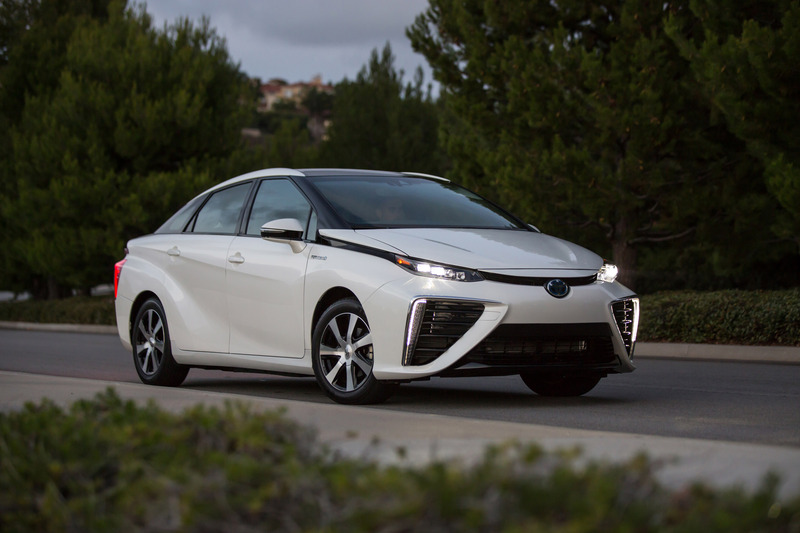 Drivers can also expect the same level of convenience as offered by gasoline engine vehicles, with a generous cruising range and a hydrogen refueling time of about three minutes3. 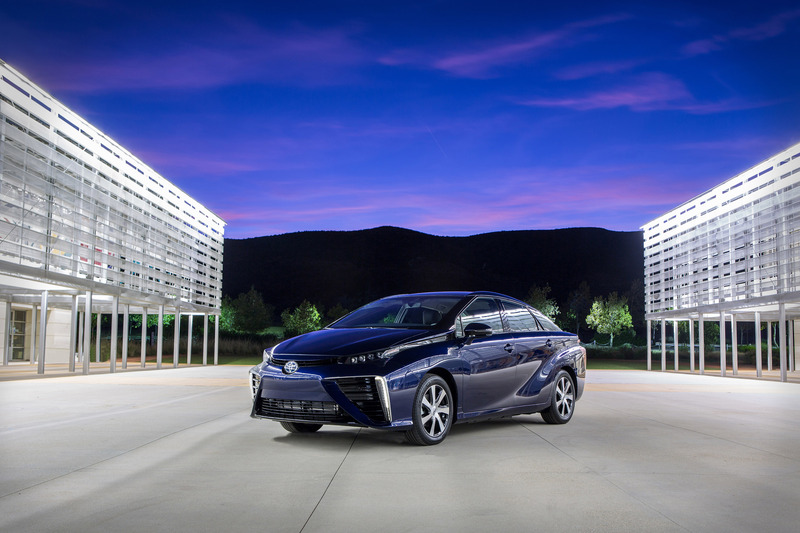 The Mirai delivers everything expected of a next-generation car: an immediately recognizable design; driving exhilaration stemming from superior handling stability achieved by a low center of gravity; and quiet but powerful acceleration provided by the electric motor. 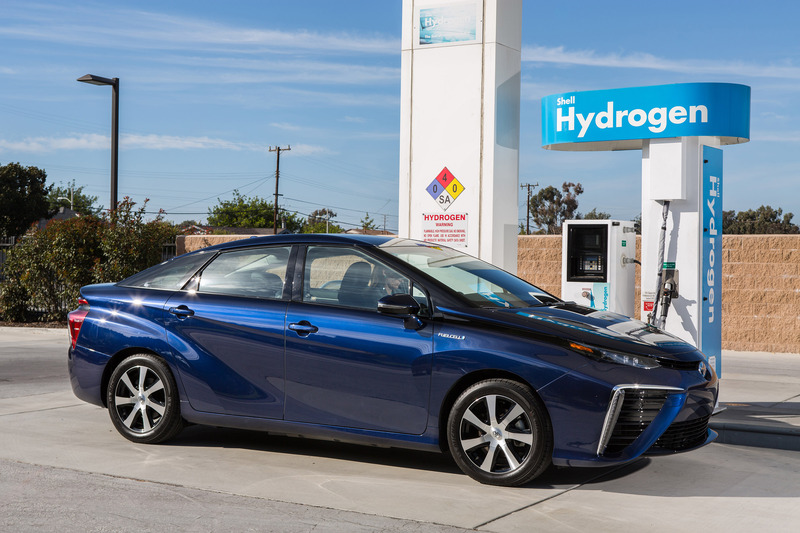 Hydrogen can be generated using a wide range of natural resources and man-made byproducts such as sewage sludge. It can also be created from water using natural renewable energy sources like solar and wind power. When compressed, it has a higher energy density than batteries, and is relatively easy to store and transport, therefore it also carries expectations for potential future use in power generation and a wide range of other applications. FCVs are able to generate their own electricity from hydrogen, meaning they can help make a future hydrogen-based society a reality, and are therefore expected to further contribute to accelerating energy diversification. The Toyota Mirai features the TFCS, a fusion of fuel cell technology with hybrid technology. The system provides better energy efficiency than internal combustion engines, superior environmental performance with no emissions of CO2 or pollutants when driving, and the same level of convenience and autonomy as gasoline engine vehicles, and a hydrogen refuelling time of about three minutes. 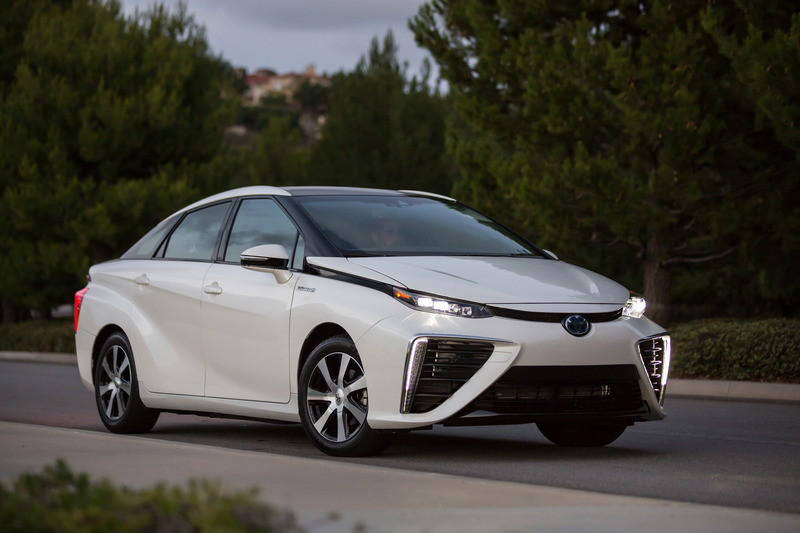 The system uses Toyota-developed components including the Toyota FC Stack, FC boost converter, and high-pressure hydrogen tanks. 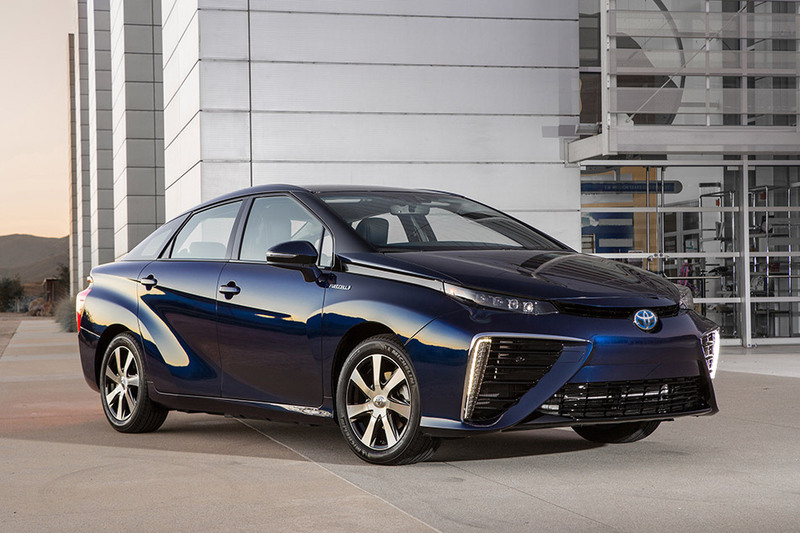 The new Toyota FC Stack achieves a maximum output of 114 kW (155 DIN hp). Electricity generation efficiency has been enhanced through the use of 3D fine mesh flow channels (a world first), which ensure uniform generation of electricity on cell surfaces, providing compact size and a high level of performance, and a world-leading power output density of 3.1 kW/L (2.2 times higher than that of the previous Toyota FCHV-adv limited-lease model). The amount of water on fuel cell electrolyte membranes has a substantial influence on electricity generation efficiency. Control of the amount of water is carried out using an internal circulation system for circulating the water created when generating electricity, meaning the Toyota FC Stack is a world-leading system that, unlike systems used in all other previous Toyota fuel cell vehicles, does not require the use of a humidifier. A new compact, high-efficiency, high-capacity converter has been developed to boost power generated in the Toyota FC Stack to 650 volts. 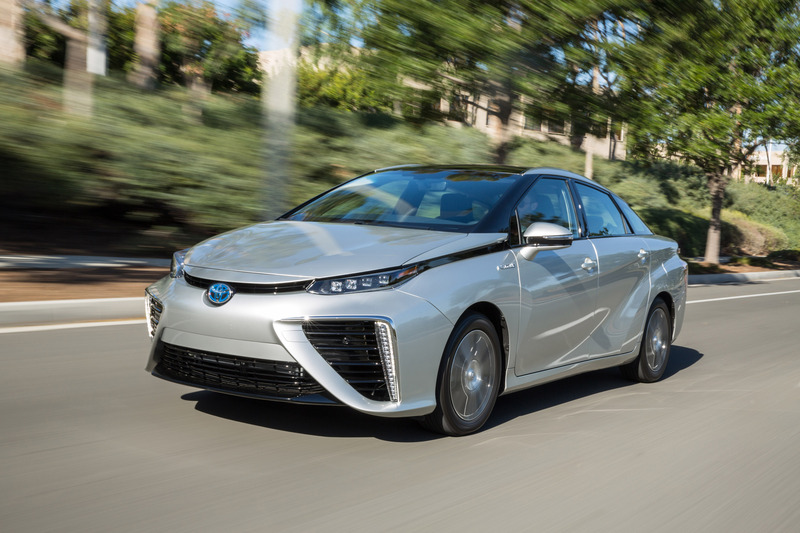 Increasing the voltage has made it possible to reduce the size of the electric motor and the number of Toyota FC Stack fuel cells, leading to a smaller, higher-performance Toyota Fuel Cell System, thereby reducing system costs. Tanks with a three-layer structure made of carbon fiber-reinforced plastic and other materials are used to store hydrogen at a very high pressure of 70 MPa (70 megapascals, or approximately 700 bar). Compared to the high pressure hydrogen tanks used in the Toyota FCHV-adv model, tank storage has been increased by approximately 20 percent while both weight and size have been reduced to achieve a world-leading5 5.7 wt%. 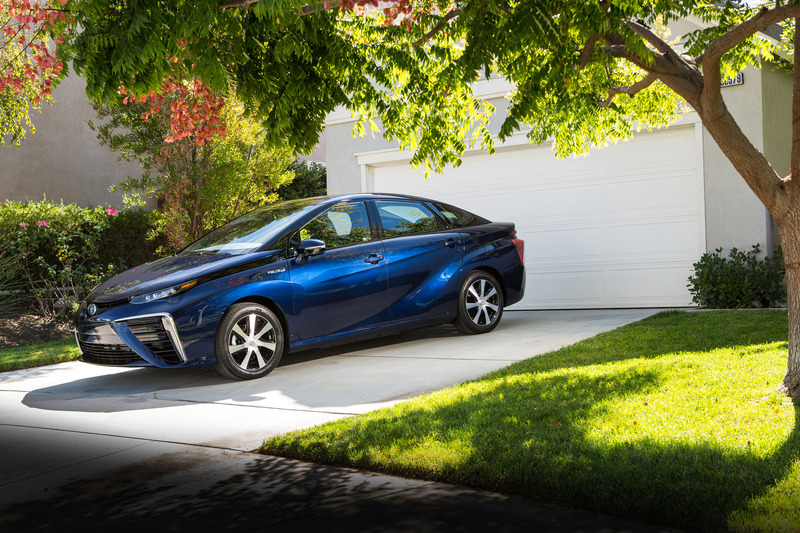 The Toyota Mirai was designed with safety as a top priority, based on the basic approach of ensuring that hydrogen does not leak, and in the unlikely event that any leaks do occur, ensuring immediate detection and stoppage of hydrogen flow and preventing accumulation of hydrogen within the car body. 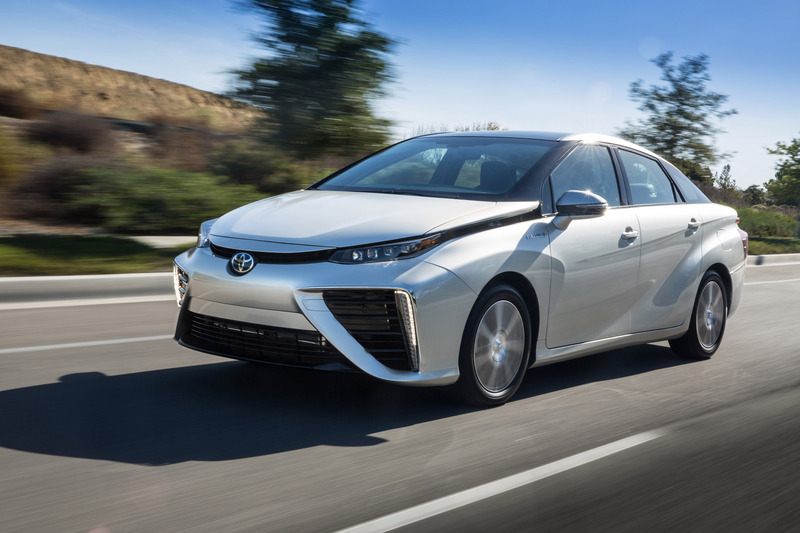 Use of features such as a structure that efficiently disperses and absorbs impact energy across multiple parts ensures a high impact safety performance that protects the Toyota FC Stack and high-pressure hydrogen tanks during frontal, side or rear impacts. The Toyota FC Stack frame is constructed from a newly-developed thermoplastic carbon fiber-reinforced plastic, which is light, strong, and easily mass-produced. This protects the Toyota FC Stack by absorbing impact shocks from road bumps and other road interference. A Pre-collision System (with millimeter-wave radar) helps prevent collisions or reduce collision damage through alerts and brake control if a high likelihood of collision is detected. A Lane Departure Alert system uses a camera to detect white or yellow lane markings and alerts the driver when the vehicle is about to deviate from its lane. Drive-start Control limits sudden starts or sudden acceleration during gear-shift operation. A Blind Spot Monitor uses radar to detect vehicles in adjacent lanes and helps rear view confirmation when changing lanes. A new technique has been employed in the front face design to emphasize the left and right grilles that draw in air for the oxygen supply and for FC system cooling. The novel front face underscores the vehicle's individuality. The elegant side profile evokes the flowing shape of a droplet of water to express the vehicle's characteristic of drawing in air and emitting water. The roof-side rails and hood appear to pop out of the body to create the impression of a low-to-the-ground vehicle while communicating a futuristic feeling. The rear of the vehicle presents a bold profile with a trapezoidal shape extending from the license plate garnish to the bottom of the bumper corners and out toward the wheels, while the top of the bumper emphasizes width and expresses a powerfully stable stance. It also creates an agile and clean impression of air passing through and under the bumper. The headlights exhibit high-tech and sophisticated luxury through a novel design that presents an ultra-thin profile with an inline arrangement of four LED lights plus visible heat sinks and other optical equipment. The front turn signals and clearance lights are separate from the headlights, contributing to an ultra-thin headlight profile at the same time as merging with the side grilles. This creates an advanced clean design with aerodynamics that improve airflow. 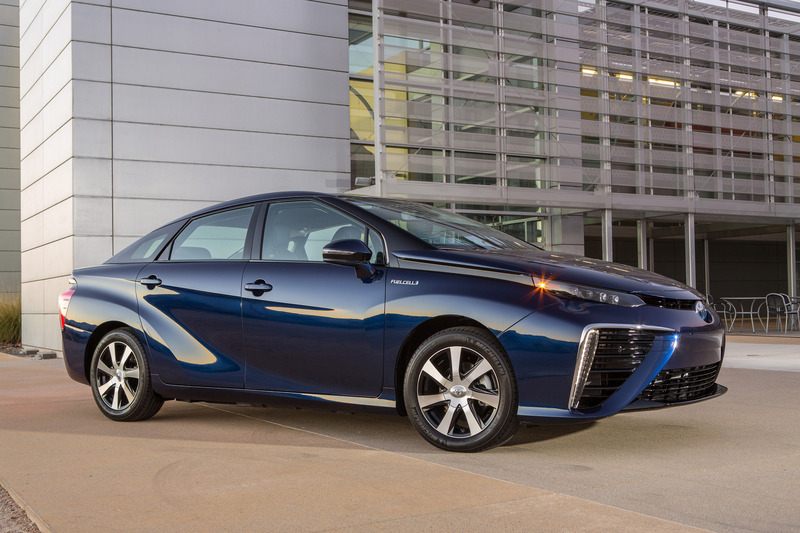 The Toyota Mirai comes with 17-inch aluminum wheels that have been made lighter using an engraving process. Six body colors are available. 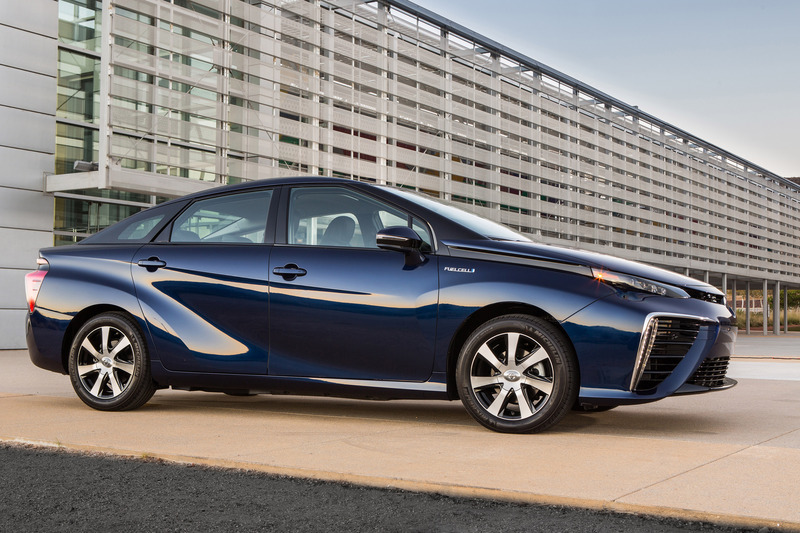 The Toyota Mirai's profile connects the front and rear in a seamlessly pleasant expression of space. It creates a sophisticated cabin space with soft padding on door trims and other interior surfaces, and a high-luminance silver finish throughout. The front seats provide superior body fit and hold through an integrated cover/seat foaming production process. Eight-way adjustable power seats for achieving the optimal seat position and a motorized lumbar support function are installed as standard on the driver's and passenger's seats. The center meter cluster located in the central top level of the instrument panel includes a speedometer and multi-information display using a 4.2-inch high-definition TFT liquid crystal display with a design that appears to pop out. The driver is able to change the display using steering-wheel-mounted controls. Seat heater switches and other controls are operated via an electrostatic air conditioning control panel by lightly touching the flat panel display. Functions that provide a comfortable interior space come as standard, such as a steering wheel heater and seat heaters (two temperature settings on all seats) that provide instant heat while greatly reducing power consumption, fully automatic left and right independent temperature control air conditioning with eco mode switches, and "Nanoe" air purification technology to fill the cabin with fresh air. Three interior colors are available, including Warm White. Battery layout enables abundant trunk storage space. The high output Toyota FC Stack and optimal battery power control drive the electric motor and ensure powerful responsiveness at all vehicle speeds. This provides an immediate increase in torque at the first press of the accelerator, and powerful and smooth acceleration thereafter. Handling stability and ride comfort are both improved through the location of major parts such as the Toyota FC Stack and high pressure hydrogen tanks centrally under the floor to achieve a low center of gravity and superior front-and-rear weight distribution, as well as the use of a high-rigidity body, which features enhanced rigidity around the rear suspension. The full under-floor cover and aerodynamically designed clearance lights reduce wind resistance and contribute to improved fuel efficiency and handling stability. Aero fins employed at the side of the rear combination lamps also improve straight-driving stability. Outstanding quietness is achieved by electric motor drive at all speeds and reduced wind noise, plus full sealing of all body parts, and the use of sound-absorbing and sound-blocking materials optimally arranged around the cabin, including the use of noise-reducing glass for the windshield and all door windows. The "Bs" (brake support) mode makes efficient use of regenerative braking and improves braking performance when the driver wishes to greatly reduce vehicle speed such as when negotiating long downhill sections of road.